The marks shown here may or may not be related but all include the initials 'L.B.'. While version #1 could be a simple importer/distributor mark, version #2 is more like a decorator mark. 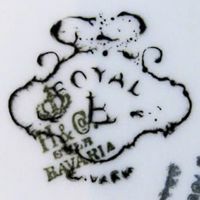 One should hold in mind that the original item marks may be much older than the decorator mark, for example the items could easily have been (re)decorated in the 1950s or 60s. 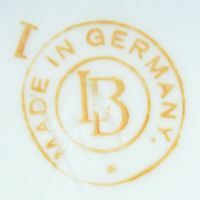 Initials 'L B' encircled by 'MADE IN GERMANY'. 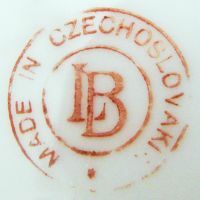 Initials 'L B' encircled by 'MADE IN CZECHOSLOVAKIA'. 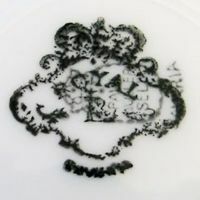 'Open' decorator mark on an item originally made between 1920 and 1930 by Paul Müller (Selb, Bavaria). 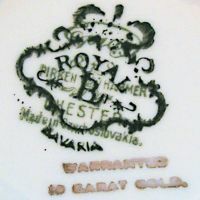 'Open' decorator mark on an item originally made between 1911 and 1934 by Heinrich & Co. (Selb, Bavaria). 'Open' decorator mark on an item originally made between 1920 and 1939 by Fischer & Mieg (Pirkenhammer, Bohemia). 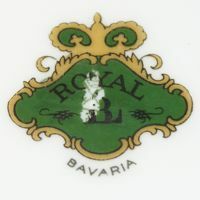 ⇒Cover-up mark, 'ROYAL' above the initials 'L B' and 'BAVARIA'.